Get the best price for your airline tickets. Everyone needs a vacation to look forward to, and now that summer is over and everyone is back into the grind, it's time to start thinking about your next holiday...and making sure you're not overpaying for your flight to get there. It's a topic we can all get behind, because no one likes to overpay and once in a while we all need a refresher on how to get the most from our vacation dollar. Compare air tickets early. Compare often. As soon as you know when and where you're flying, compare airfares and compare them often to get a feel for what's a good deal and what's not. Prices often fluctuate and comparing fares frequently will give you the needed background to know when it is best to book. Travelling in a small group? Compare fares as a group and individually. Play with the numbers and see if it makes more sense to book everyone together or individually. It's been said the airline reservation system has a quirk that everyone on the same booking pays the same price. If true, then you could save money if everyone looks after their own flight tickets. Watch the calendar and avoid flying when school is out, there's a long weekend, or on the days prior to a holiday like Christmas. The days leading up to a major holiday may be the best days to avoid from a price standpoint, but travel the day of, and chances are you can get a deal. If your travel plans are flexible, give or take a day or two, then compare prices for flights the day before and the day after. You never know, you could luck into a cheap flight. Mid-week flights are more likely to have seats to fill, so you can often find cheaper flights Tuesday, Wednesday or Thursday. Whether flying for business or pleasure, most of us want to get to where we are going early (or get back before the day is over) making mid-day flights—for those not on a strict timetable—a good option when looking for the cheapest flights. If your only requirement is to get away from your home town for a while then last minute flights can offer some real bargains. Last minute flights can be a money-saver, but only if you're flexible and open to the options available at the time. If you have a set destination in mind, then waiting for last minute flights will likely leave you disappointed. If your search for the cheapest flights sends you somewhere you never wanted to go, then it wasn't really a bargain after all. If last minute flights make you nervous, it has been reported that you'll likely find the best prices three months in advance (if flying internationally) and two months in advance, if flying to the U.S. or within Canada. Advance seat selection will add to your ticket. Many airlines nowadays offer you the opportunity to pick your seat well in advance of your travels, for a fee. 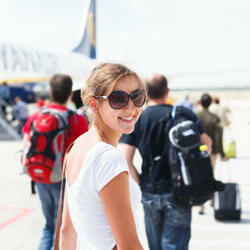 Save money by selecting your seats during the check-in process rather than in advance. Is luggage included in the price? Keep an eye on what the price includes, and perhaps more importantly, excludes. Many airfare prices don't include the costs of bringing luggage so even though the price might look great, it may not be the total cost if you'll be checking a bag. Look at flights from nearby airports. For areas that are serviced by more than one airport, and if it's convenient for you, look at flights going into and out of nearby airports. For example, if you're travelling to or from Toronto you could look at flights not only at Pearson, but also Billy Bishop (the Island Airport), and in Hamilton or Buffalo. Lots of us collect them, but do we redeem them? Stop saving your travel rewards and start using them to lower the cost of your airfare. If you don't yet have a travel rewards credit card, you're missing out on one of the easiest ways save on travel. No matter where your plane lands, make sure you pack travel insurance. Travel insurance is not a nice-to-have, it's a must have. No matter how short your trip, or how close to home you'll be, the importance of having travel insurance can not be overstated.